In October of 1977, just in time for Halloween, record store racks were graced with the amazing cover art of Meatloaf’s Bat Out of Hell album. The vivid, now iconic, scene of a motorcycle rider blasting his way out of the grave was at the time an irresistible lure to purchase the album. To those of us involved in comic fandom the work was instantly recognizable as that of Richard Corben. With the release of Spirits of the Dead on October 1 Dark Horse Comics will similarly enlist Corben to get the 2014 Halloween season firmly in flight. The hardcover anthology will ensnare the artist’s entire Edgar Allan Poe corpus into one voluminous tome. Dark Horse has in the last two years published several outstanding single story issues of Corben’s Poe adaptations and now pulls them all together with earlier works. Throughout Spirits of the Dead we are treated to all manner of morbid machinations served up via Corben’s one of a kind style which lends itself so well to the gothic, grisly and gruesome. His penchant for gnarly characterizations inspected in and panel by panel close-ups prove a fitting visual analog for the psychological horror that Poe is noted for. Presented within the book’s over 200 pages are 14 adaptations in chronological order as written by Poe not illustrated by Corben. We’re offered a mix of the familiar and the less celebrated, ranging from visual tone poems based on “The Sleeper” and “Alone” through mid-book magnum opus, the nearly 50 page “The Fall of the House of Usher,” to end with “The Cask of Amontillado.” Along the way “Masque of the Red Death” and “Murders in the Rue Morgue” are stand out personal favorites. “Masque” for Corben’s imaginative, madly colored, visions of the reveler’s costumes, and “Rue Morgue” for its unfettered depiction of the savage protagonist. None of Corben’s Poe pieces are slavish to their source material. The word adaptation should be taken literally, and that’s part of the fun. 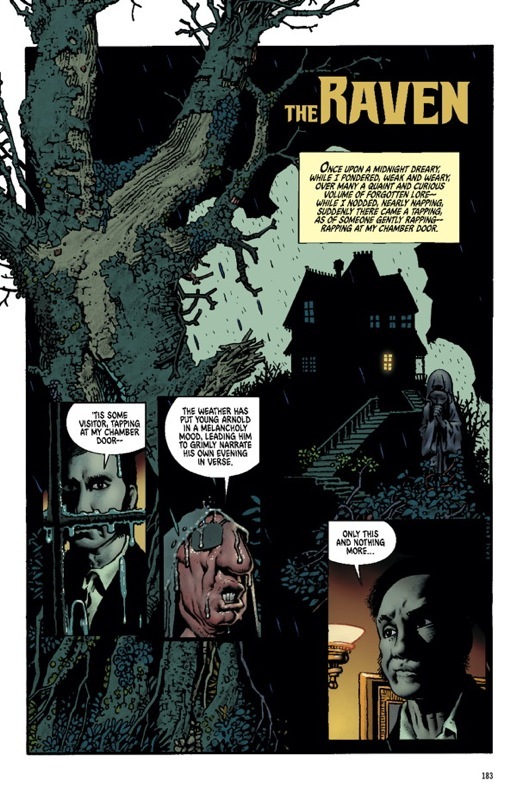 This is especially true of the artist’s interpolation of the poetic works as Professor M. Thomas Inge (The Incredible Mr. Poe: Comic Book Adaptations of the Works of Edgar Allan Poe) points out in his introduction. Often injected into the stories is narrator, “Mag The Hag.” The hulking hooded and eye patched witch finds rye humor in almost every unpleasant situation and denouement, sometimes as a framing mechanism and others as a participant in the narrative. I suspect I’m not alone in having a Halloween section in my personal library. A nice handful of books that help conjure the season. Ray Bradbury’s The Halloween Tree rightfully tops the list, but there are plenty of others including last year’s The Halloween Legion. 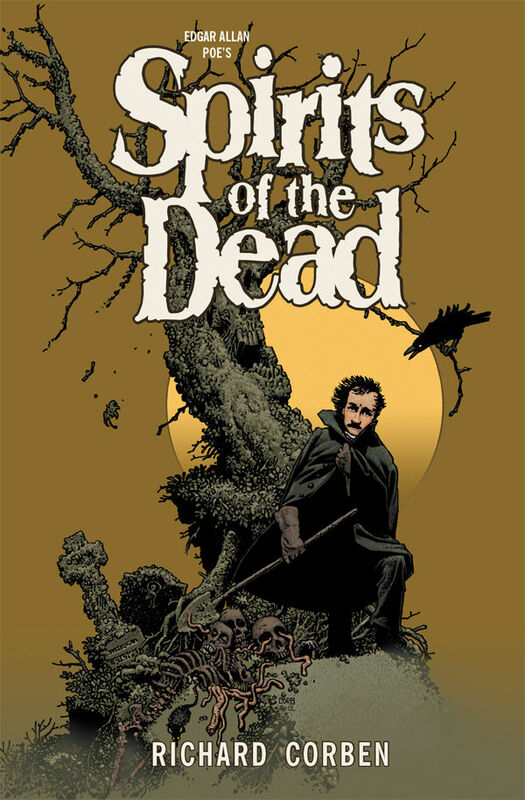 I expect that Spirits of the Dead will find a comfy niche in that group alongside the recently published Poe and the Visual Arts in which author Barbara Cantalupo shows how Poe’s verbiage was influenced by the illustrative arts of his time. Writers: For an informative treatise on The Philosophy of Composition by Poe himself follow this link to his discourse on the gestation of The Raven.